A video of Anil Kapoor kissing his co-star Bobby Deol has gone viral on social media. And, more than their bromance, it's Salman Khan's reaction, which is breaking the internet. The video was posted on Instagram by a fan club. In the video, the trio - Salman, Anil and Bobby - can be seen engaged in a conversation, when all of a sudden Anil steps up and plants a kiss on Bobby Deol's cheek. The individual recording all of this then shifts his focus to Salman Khan, who couldn't control himself and burst out laughing. Salman and the entire team of Race 3 are reportedly in Abu Dhabi, where they are also gearing up for the film's promotion. Take a look at the video, which was posted on Instagram. Here are some of pictures of the Race 3 team that are going viral on social media. As of now, Salman Khan and Jacqueline Fernandez's first look from the film have been unveiled. 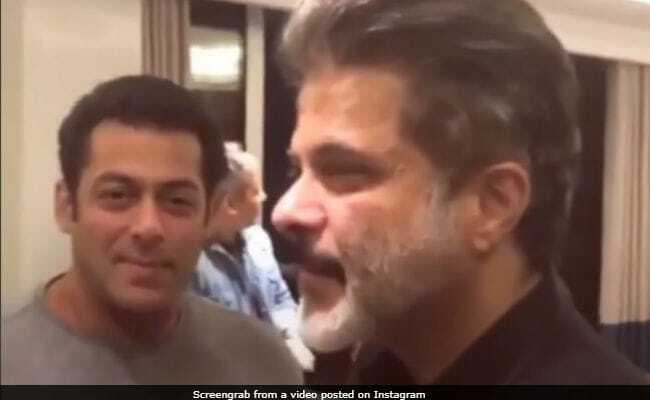 Salman introduced himself as Sikander on Instagram and wrote, "Is hafte milata hoon Race 3 ki family se ... mera naam hai Sikander. Selfless over selfish." Later, he also unveiled Jacqueline's look and captioned it, "Jessica: Raw power." Salman and Jacqueline have previously worked together in Sajid Nadiadwala's directorial debut Kick. Helmed by Remo D'Souza, Race 3, is the third film in the franchise. The earlier two films were directed by Abbas-Mustan. The film also stars Anil Kapoor, Bobby Deol, Daisy Shah and Saqib Saleem in prominent roles.